From Flickr: “Henry Fonda” by Truus, Bob & Jan too! French postcard by Erpé, no. 30. Photo: Paramount. Blue-eyed American actor Henry Fonda (1905-1982) exemplified not only integrity and strength, but an ideal of the common man fighting against social injustice and oppression. He is most remembered for his roles as Abe Lincoln in Young Mr. Lincoln (1939), Tom Joad in The Grapes of Wrath (1940), for which he received an Academy Award Nomination, and more recently, Norman Thayer in On Golden Pond (1981), for which he received an Oscar for Best Actor in 1982. Notably he also played against character as the villain ‘Frank’ in Sergio Leone’s classic Spaghetti Western Once upon a time in the West (1968). Fonda is considered one of Hollywood’s old-time legends and his lifelong career spanned almost 50 years. Henry Jaynes Fonda was born in Grand Island, Nebraska in 1905. His parents were Elma Herberta (Jaynes) and William Brace Fonda, who worked in advertising and printing and was the owner of the W. B. Fonda Printing Company in Omaha, Nebraska. His distant ancestors were Italians who had fled their country around 1400 and moved to Holland, presumably because of political or religious persecution. In the early1600’s, they crossed the Atlantic and were among the early Dutch settlers in America. They established a still-thriving small town in upstate New York named Fonda, named after patriarch Douw Fonda, who was later killed by Indians. In 1919, young Henry was a first-hand witness to the Omaha race riots and the brutal lynching of Will Brown. This enraged the 14 years old Fonda and he kept a keen awareness of prejudice for the rest of his life. Following graduation from high school in 1923, Henry got a part-time job in Minneapolis with the Northwestern Bell Telephone Company which allowed him at first to pursue journalistic studies at the University of Minnesota. In 1925, having returned to Omaha, Henry reevaluated his options and came to the conclusion that journalism was not his forte, after all. For a while, he tried his hand at several temporary jobs, including as a mechanic and a window dresser. At age 20, Fonda started his acting career at the Omaha Community Playhouse, when his mother’s friend Dodie Brando (mother of Marlon Brando) recommended that he try out for a juvenile part in You and I, in which he was cast as Ricky. Then he received the lead in Merton of the Movies and realized the beauty of acting as a profession. It allowed him to deflect attention from his own tongue-tied personality and create stage characters relying on someone else’s scripted words. The play and its star received fairly good notices in the local press. It ran for a week, and for the rest of the repertory season, Henry advanced to assistant director which enabled him to design and paint sets as well as act. A casual trip to New York, however, had already made him set his sights on Broadway. In 1926, he moved to the Cape Cod University Players, where he met his future wife Margaret Sullavan. His first professional role was in The Jest, by Sem Benelli. James Stewart joined the Players a few months after Fonda left, but he would become his closest lifelong friend. In 1928, Fonda went east to New York to be with Margaret Sullavan, and to expand his theatrical career on Broadway. His first Broadway role was a small one in A Game of Love and Death with Alice Brady and Claude Rains. Henry played leads opposite Margaret Sullavan, who became the first of his five wives in 1931. They broke up in 1933. In 1934, he got a break of sorts, when he was given the chance to present a comedy sketch with Imogene Coca in the Broadway revue New Faces. That year, he also hired Leland Hayward as his personal management agent and this was to pay off handsomely. Major Broadway roles followed, including New Faces of America and The Farmer Takes a Wife. The following year he married Frances Seymour Brokaw with whom he had two children: Jane Fonda and Peter Fonda, also to become screen stars. 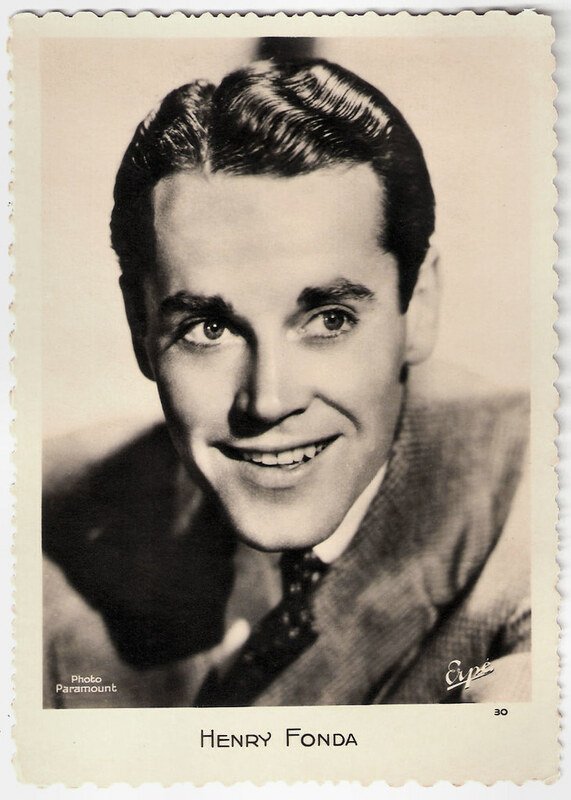 The 29-year old Henry Fonda was persuaded by Leland Hayward to become a Hollywood actor, despite initial misgivings and reluctance on Henry’s part. Independent producer Walter Wanger, whose growing stock company was birthed at United Artists, needed a star for The Farmer Takes a Wife (Victor Fleming, 1935) opposite Janet Gaynor. I.S. Mowis at IMDb: “With both first choice actors Gary Cooper and Joel McCrea otherwise engaged, Henry was the next available option. After all, he had just completed a successful run on Broadway in the stage version. The cheesy publicity tag line for the picture was "you’ll be fonder of Fonda", but the film was an undeniable hit.” Wanger, realizing he had a good thing going, next cast Henry in a succession of A-grade pictures which capitalized on his image as the sincere, unaffected country boy. Pick of the bunch were the Technicolor outdoor Western The Trail of the Lonesome Pine (Henry Hathaway, 1936) with Sylvia Sidney, and the gritty Depression-era drama You Only Live Once (Fritz Lang, 1937) with Henry as a back-to-the-wall good guy forced into becoming a fugitive from the law by circumstance). Then followed the screwball comedy The Moon’s Our Home (William A. Seiter, 1936) with ex-wife Margaret Sullavan, the excellent pre-civil war-era romantic drama Jezebel (William Wyler, 1938) featuring Bette Davis, and the Western Jesse James ( Henry King, 1939) starring Tyrone Power. Fonda rarely featured in comedy, except for a couple of good turns opposite Barbara Stanwyck and Gene Tierney – with both he shared an excellent on-screen chemistry – in The Mad Miss Manton (Leigh Jason, 1938), The Lady Eve (Preston Sturges, 1941) and the successful Rings on Her Fingers (Rouben Mamoulian, 1942). Henry gave his best screen performance to date in Young Mr. Lincoln (John Ford, 1939), a fictionalized account of the early life of the American president as a young lawyer facing his greatest court case. Henry made two more films with director John Ford: the pioneering drama Drums Along the Mohawk (1939) with Claudette Colbert, and The Grapes of Wrath (1940), an adaptation of John Steinbeck’s novel about an Oklahoma family who moved west during the Dust Bowl. In his career-defining role as Tom Joad, Fonda played the archetypal grassroots American trying to stand up against oppression. His relationship with Ford would end on the set of Mister Roberts (John Ford, Mervyn LeRoy, 1955) when he objected to Ford’s direction of the film. Ford punched Fonda and had to be replaced. The Grapes of Wrath (John Ford, 1940) set the tone for Henry Fonda’s subsequent career. In this vein, he gave a totally convincing, though historically inaccurate, portrayal in the titular role of The Return of Frank James (Fritz Lang, 1940), a rare example of a sequel improving upon the original. He projected integrity and quiet authority whether he played lawman Wyatt Earp in My Darling Clementine (John Ford, 1946) or a reluctant posse member in The Ox-Bow Incident (William A. Wellman, 1943). In between these two films, Fonda enlisted in the Navy to fight in World War II, saying, and served in the Navy for three years. He then starred in The Fugitive (John Ford, 1947), and Fort Apache (John Ford, 1948), as a rigid Army colonel, along with John Wayne and Shirley Temple in her first adult role. The following years, he did not appear in many films. Fonda was one of the most active, and most vocal, liberal Democrats in Hollywood. During the 1930s, he had been a founding member of the Hollywood Democratic Committee, formed in support of President Franklin D. Roosevelt’s New Deal agenda. In 1947, in the middle of the McCarthy witch hunt, he moved to New York, not returning to Hollywood until 1955. His son Peter Fonda writes in his autobiography Don’t Tell Dad: A Memoir (1999) that he believes that Henry’s liberalism caused him to be gray-listed during the early 1950s. Fonda returned to Broadway to play the title role in Mister Roberts for which he won the Tony Award as best dramatic actor. In 1979, he won a second special Tony, and was nominated for a Tony Award Clarence Darrow (1975). Later he played a juror committed to the ideal of total justice in 12 Angry Men (Sidney Lumet, 1957) which he also produced, and a nightclub musician wrongly accused of murder in The Wrong Man (Alfred Hitchcock, 1956). During the next decade, he played in The Longest Day (Ken Annakin, Andrew Marton a.o., 1962), How the West Was Won (John Ford, Henry Hathaway, George Marshall, 1962) and as a poker-playing grifter in the Western comedy A Big Hand for the Little Lady (Fielder Cook, 1966) with Joanne Woodward. A big hit was the family comedy Yours, Mine and Ours (Melvillle Shavelson, 1968), in which he co-starred with Lucille Ball. The same year, just to confound those who would typecast him, he gave a chilling performance as one of the coldest, meanest stone killers ever to roam the West, in Sergio Leone’s Western epic C’era una volta il West/Once Upon a Time in the West (1968) opposite Charles Bronson and Claudia Cardinale. With James Stewart, he teamed up in Firecreek (Vincent McEveety, 1968), where Fonda again played the heavy, and the Western omedy The Cheyenne Social Club (Gene Kelly, 1970). Despite his old feud with John Ford, Fonda spoke glowingly of the director in Peter Bogdanovich’s documentary Directed by John Ford (1971). Fonda had refused to participate until he learned that Ford had insisted on casting Fonda as the lead in the film version of Mr. Roberts (1955), reviving Fonda’s film career after concentrating on the stage for years. Illness curtailed Fonda’s work in the 1970s. In 1976, Fonda returned in the World War II blockbuster Midway (Jack Smight, 1976) with Charlton Heston. Fonda finished the 1970s in a number of disaster films wilth all-star casts: the Italian killer octopus thriller Tentacoli/Tentacles (Ovidio G. Assonitis, 1977), Rollercoaster (James Goldstone, 1977) with Richard Widmark, the killer bee action film The Swarm (Irwin Allen, 1978), the global disaster film Meteor (Ronald Neame, 1979), with Sean Connery, and the Canadian production City on Fire (Alvin Rakoff, 1979), which also featured Shelley Winters and Ava Gardner. His final screen role was as an octogenarian in On Golden Pond (Mark Rydell, 1981), in which he was joined by Katharine Hepburn and his daughter Jane. It finally won him an Oscar on the heels of an earlier Honorary Academy Award. Too ill to attend the ceremony, Henry Fonda died soon after at the age of 77, having left a lasting legacy matched by few of his peers. His later wives were Susan Blanchard (1950-1956), Leonarda Franchetti (1957-1961) and Shirlee Fonda (1965- till his death in 1982). With Blanchard he had a daughter, Amy Fishman (1953). His grandchildren are the actors Bridget Fonda, Justin Fonda, Vanessa Vadim and Troy Garity. Sources: Laurence Dang (IMDb), I.S. Mowis (IMDb), Wikipedia, and IMDb. From Flickr: “Yvonne De Carlo in Salome Where She Danced (1945)” by Truus, Bob & Jan too!